Tusker House is one of my favorite restaurants in all of Walt Disney World – great food, fun character interactions, what's not to like? My only complaint was that the characters only appeared at breakfast and lunch. So I am extremely excited that beginning March 8, 2015, Tusker House will be adding characters at dinner! 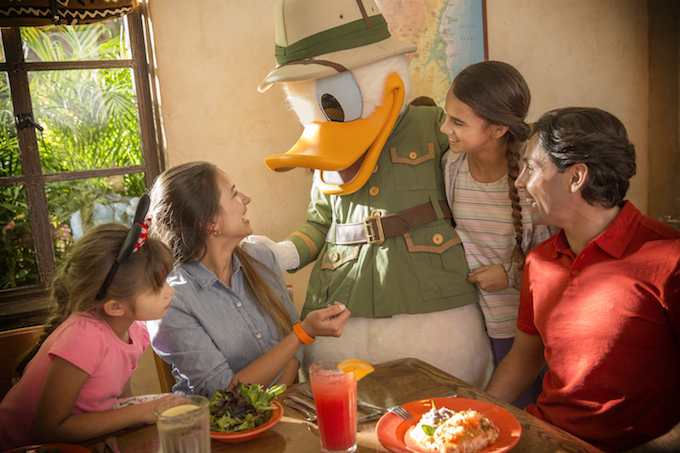 So now I can indulge in my favorite seafood stew, israeli couscous, and delicious desserts, and get to see Donald and his friends after a day at Animal Kingdom! There is also spit-roasted meats, a salad bar with unusual offerings (and a great bread selection), and vegetarian options! I've enjoyed the character breakfast there, but the trend towards almost all restaurants pretty much requiring advance reservations is a bit disappointing. With the inclusion of Beaches and Cream, the idea of meeting up with friends for a spontaneous meal is rapidly slipping away. I know this is somewhat balanced by being able to know you will get a table. But I had someone tell me recently that if they didn't go to WDW with me, they might not go because there was so much to know and do in advance. Of course, I'd refer them to a great travel agent who knows Disney!